DKI high-performance PTFE Rotary Shaft Seals are specially designed for the demanding condition of reliably sealing rotating shafts with high peripheral speeds, high pressure and temperature fluctuations and aggressive media. In such demanding applications conventional radial shaft seals with elastomer sealing lips are of only limited use or often no use at all. A seal in the thermo-elastic high-performance PTFE Shaft Seal series is the sensible alternative to mechanical seals and packing. 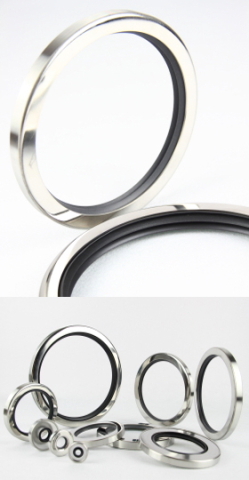 Use of PTFE Shaft Seal offers in many applications the ideal answer to your problem and really reliable sealing. PTFE Rotary Shaft Seal is suitable for a wide range of applications, in the chemicals industry, process engineering, and general machine construction. ・Suitable for applications under pressurized or vacuum conditions. ・Capable of handling high peripheral speeds. ・Suitable for a temperature range of -90℃ to +250℃. ・Outstanding resistance to chemical media. ・Can be used in the food and drinks industry and in the pharmaceuticals industry. ・Good dry-running characteristics, low friction, and good resistance to wear and tear.